If I were being sentenced to live out my days on a desert island with only one companion, and had to choose between a dog and a human, I would almost certainly choose the dog. Call me what you will but that’s the way I am and I’m not going to apologize for it. I’ve been crazy about dogs since I was three years old when my brother brought home Winston, an English bulldog who was his college fraternity's mascot, to spend the summer with our family. Winston, who had been raised in a houseful of frat boys who taught him tricks galore, had a gentle disposition that belied his gruff appearance. We immediately took to each other. Every time I pulled my red Radio Flyer wagon, he leapt into into it, started barking, and continued barking until it came to a halt. I must have pulled that barking bulldog around the block a hundred times that summer, stopping often to sit with elderly neighbors on their front porches as I prattled on about Winston’s and my adventures since our last visit. When my brother and Winnie went back to college that fall, I was bereft. At age nine, after years of nonstop begging – my parents didn’t even like dogs – I finally got one to call my own, a rat-terrier mix I named Ichabod after the title character of the short-lived CBS series, Ichabod and Me. He was a faithful companion until my senior year of college. Two years later, a blind date and I discovered we were both dog crazy and while I can't speak for her, I wouldn’t have married her if she wasn’t. Since then we have had nine – at least two, and sometimes three, dogs at any given time. We even had two dogs during the five years we lived in a Manhattan high-rise. My son once warned my nephew, before his first visit to our home, that for every framed photo of our children displayed around the house there were three of our dogs, past and present. My nephew counted them up. Our son was right. 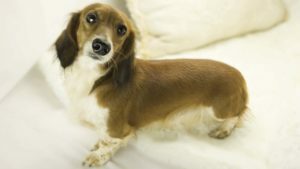 We picked up our tenth dog, a three-year-old long-haired piebald dachshund, on Saturday. His head is resting on my arm as I type. Until Saturday Josh – that’s his name and we’re keeping it – was a stud at a kennel north of Tampa where he had a large fenced yard and dozens of canine friends to romp with. We brought him home in a plastic dog crate from which he refused to emerge for three days other than to eat, drink or eliminate. He wouldn't as much as look at us. Not only was he freaked out but, I’d have to imagine, depressed. One day you’re running around being a stud without a care in the world. The next your balls are gone and you’re in a crate being driven God knows where by two strangers as a neurotic old dachshund with bad breath (Billy Ray, who is almost 14) is trying to claw his way inside. We wanted to reach into his crate, pull Josh out and reassure him that he has been chosen to become a prince among dogs but resisted – we didn’t want him to feel threatened in any way, so we left him alone. On the fourth morning, as if a light bulb had gone off in his head, he looked around and apparently realized that, while his world has changed, the man and woman talking baby talk to him have only the best of intentions. He emerged from his crate, yawned, stretched and for the next two days stuck to us like glue, following us – especially me – everywhere. That’s particularly gratifying because four of our five other dachshunds have been one person dogs and that person wasn't me – it was my wife. Given her druthers, Bonnie, our 16-year-old who died in April, also preferred my wife but she, unlike the others, allowed me to cuddle when my wife wasn't available. Today, Josh is less clingy and has ventured off to explore his new environment on his own. He even fell asleep in the exact spot where Bonnie spent every morning soaking up the sun. Of the dachshunds that have owned us over the years, Josh appears to be the most chill and the smartest. (Of course, he’s the smartest, he’s the only one who has ever willingly spent time with me.) Though he had never lived in a house before, he is already housebroken has only had one accident and that was my fault because I wasn’t keeping my eye on him as I proofread this. And he is eager to please, following me around and around the pool, stopping when I stop and looking up brightly, as if awaiting further instruction. When I sit down in a chair, he jumps up to sit with me. When I get up to get a drink of water or go to the bathroom, he follows. When I go into the den to use the printer, he tags along and watches my every move. I am smitten. As if you didn’t know that already.